A UN report on Syria says limited quantities of unknown chemical agents have been used in at least four attacks in a civil war that has reached “new levels of brutality.” It said there’s proof of war crimes and crimes against humanity. 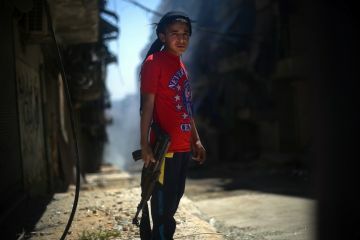 The Commission of Inquiry on Syria, tasked since 2011 with investigating human rights violations, said it had “reasonable grounds” to believe rebels have used toxic agents, although the “majority” of attacks were probably committed by President Bashar al-Assad’s forces. Commission inquiry chair Paulo Pinheiro told reporters in Geneva that investigators could not “determine the precise chemical agents used, their delivery systems or the perpetrator.” Conclusive proof may be obtained from test samples taken from victims or the soil of suspected areas, but so far Damascus has barred a team of experts from the country. The statement did not get into whom is believed responsible for using the deadly nerve agent in Syria, according to France24, but did say “[i]t would be unacceptable that those guilty of these crimes benefit from impunity.” Also Tuesday, Britain said it had also found evidence of sarin gas use in Syria, reported AP. The UN report, without much detail, lists the time and locations of four alleged chemical attacks: The Khan al-Asal neighborhood of Aleppo and Uteibah, both on March 19, the Sheikh Maqsood district of Aleppo on April 13, and on the northwestern town of Saraqab on April 29. Commission member Carla del Ponte, a former war crimes prosecutor, warned that the issue of chemical agents could overshadow the mass suffering of Syrians in a war that has killed more than 94,000 people and displaced millions. “We have so many deaths in Syria now… so please don’t make the use of chemical weapons in Syria now the most important issue,” she told reporters. The UN report says at least 17 new massacres are under review, which makes a total of 30 since September. “The war in Syria is a major catastrophe of our time,” Pinheiro said. “Syria is in free-fall,” and “brutality has become a tactic of war,” including forcing child hostages to witness torture, and 86 child combatants killed. The report comes a day after US Secretary of State John Kerry said the United States had arrived “late” to the Syrian peace process, with political unrest now quickly escalating in neighboring Turkey. “This is a very difficult process, which we come too late,” Kerry said after a State Department meeting with Poland’s foreign minister, Radoslaw Sikorski. “We are trying to prevent the sectarian violence from dragging Syria down into a complete and total implosion where it has broken up into enclaves, and the institutions of the state have been destroyed, with God knows how many additional refugees and how many innocent people killed,” Kerry added. The UN commission urged the international community to find a diplomatic solution that would include all Syrians, and called on world leaders to restrict arms sales feeding the war, despite a recently lifted EU arms embargo on Syria and Russia’s sale of the S-300 surface-to-air missile defense system to Damascus. It’s unclear when those missiles will arrive. Hundreds of rebels from northern Syria managed to enter the besieged city of Qusair on Friday, activists said, to help opposition forces battling government troops backed by the Lebanese terrorist group Hezbollah. The Syrian Observatory for Human Rights said hundreds of fighters from the Tawheed brigade, an Islamist group that is powerful in Aleppo in the north, had entered the town. The brigade confirmed the report on its Facebook page. The two-week battle for Qusair is aimed at securing supply routes near the Syrian-Lebanese frontier, which both sides accuse the other of using to bolster their forces inside Syria.